OK, this one isn’t exactly news anymore; it came out over a year ago. 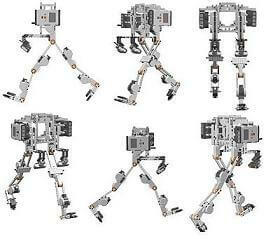 But it hasn’t been posted here before, and is so cool that I just had to make sure you’ve seen it: a biped robot, with a very human-looking gait, made out of nothing but LEGO. The robot was built by students at the Friedrich Schiller University of Jena. It’s not self-supporting at this point; it’s held up by strings and can walk only on a treadmill. But it does demonstrate the proper two-phase (swing/stance) gait and heel-toe step characteristic of human walking. In short, you really need to check out the video below. For more details, see the article at Singularity Hub.